A lot of readers were excited when Abattoir of Dreams came out and having read it, I can see why. I chose this as my kindle loan book for the month but I wouldn't have hesitated to buy a copy just to get my hands on it to find out what everyone was raving about. Michael Tate is in hospital with amnesia, accused of killing his girlfriend, Becky. Although he has no memory of events, he must have done it as everyone tells him so. In order to escape capture after killing Becky, he apparently jumped off the roof of his building and is left paralysed from the waist down. Lying in his hospital bed, he thinks he must have overdone the painkillers when he sees an emergency door appear in his room. A door that only he can see. Where did it come from and where does it go to? As an invisible force lifts him from his bed, puts him gently in the wheelchair and pushes the emergency door open, Michael is wheeled back to his past. Think Scrooge in A Christmas Carol, except Michael doesn't know who has come back to visit him - who desperately wants him to remember what happened in the past? WOW! What an AMAZING book. I knew it would be good, as all the book bloggers said it was, but I didn't expect it to be THIS good. It went in directions I never expected, breaking my heart in two at times and had tears rolling down my face in laughter at others. I can't look at a catflap without bursting into fits of laughter, imagining Michael and his friend, Liam, crawling through. Michael had such a hard life and the friendship he forged with Liam saved his life on more than one occasion. It just shows that no matter how bad your circumstances, something good can come out of adversity. Not that I am condoning what happened to Michael and Liam, but the friendship that the boys had was second to none. They helped each other more than they can ever imagine and my heart swelled with feeling for both of them. 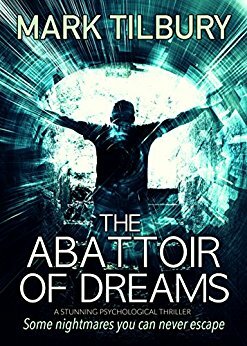 I loved the tangible flashbacks in The Abattoir of Dreams. It felt like two books in one, both equally as good as the other, so a bumper prize for anyone who reads it. Who is the ghost of Michael's past? I couldn't have told you straight away as I had to read the end twice with crying so much! Michael's story really got under my skin and I admit to finding it difficult reading at times. The world is indeed cruel. Awesome, heartbreaking and amazing The Abattoir of Dreams is a spectacular book that should not be missed. Completely unique and unusual; I was completely enthralled from start to finish.